This is my second attempt at the same US Dollar index trade within 24 hours. What I had attempted in my previous blog entry was a swing trade as prices approached the moving average. Prices moved favorably long enough for me to move my stop loss just beyond break even. Prices then turned against me and I was stopped out with a tiny profit. Prices are now still close enough to the moving average that I would still call it a swing trade with a profit target towards the bottom channel line. All this is applicable to the 60 minute chart, by the way. 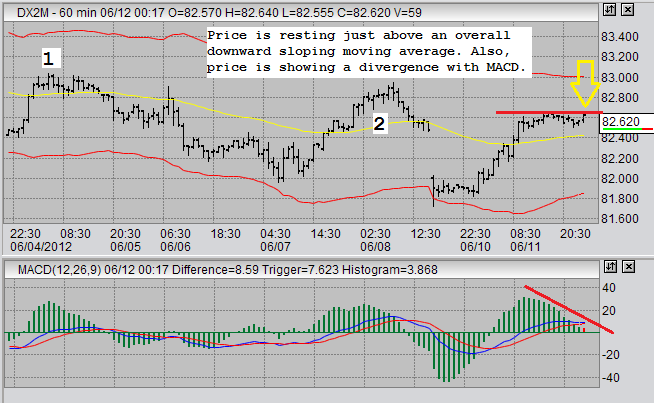 In addition, price seems to be making somewhat of a divergence with MACD. Specifically, the MACD histogram. In essence, we are seeing a swing trade with an MACD divergence entry signal. A short sell entry was made at 00:16 my time at a price of 82.62 in June US Dollar index futures. As always a stop loss order is being put into place as insurance. The stop will be trailed if prices move in my favor. Below is the 60 minute chart for the USDX June contract, which expires early next week. Again, notice in the chart how price is still relatively close, just above the yellow central moving average. Overall, we are seeing prices trending down. Price is, at this moment, situated in the general area we'd want to enter into a short swing trade. Also, notice the red line on price indicating equal highs. Just after taking that screen shot prices went as high as 82.665, thus creating a higher high for the immediately preceding prices. Meanwhile, MACD steadily trends lower. This is a MACD divergence and it is a signal I look for the make entries. In this case, the divergence trade and the swing trade coincided giving the same sell signal. Basically, what I am looking for here is a repeat of the areas market 1 and 2 on the chart. In other markets, I continue to hold a long position in December gold futures. I am continuing to watch sugar very closely with an eye to get long, but I've struggled to find an entry that I like. I am watching Australian Dollar futures with a bias to the long side, but again, I haven't spotted a precise entry point that I like.